Lying between the Conwy Valley and the Vale of Clwyd, and extending north from the edge of the heather moorland of Mynydd Hiraethog towards the coast, is a hidden, beautiful, unspoilt part of North Wales, generally by-passed by visitors as they head to nearby crowded Snowdonia. Its northern perimeter is defined by the B5381 running west from St Asaph, a former Roman road and coaching route from Chester to Conwy. This book of 25 circular walks explores the area's enclosed upland pasture, moorland fringes, hills, river valleys, woods, and small upland lakes. there are walks along the eastern edge of the Conwy Valley, including Bodnant Garden, two classic viewpoints, and around Llanrwst and Capel Garmon. 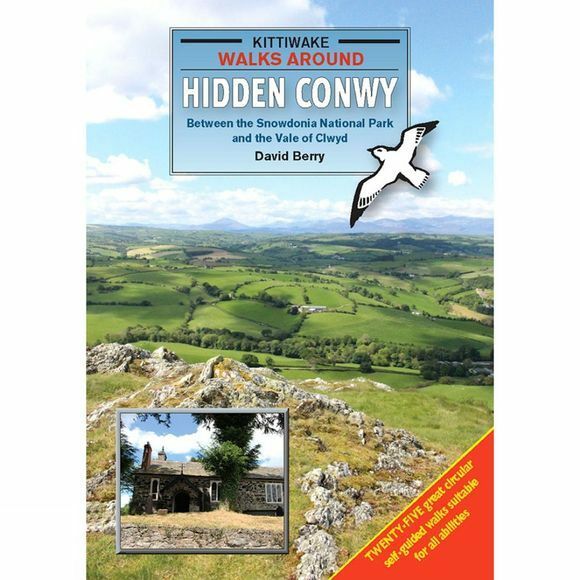 Other walks explore the undulating countryside further east, from ancient communities, including Llansannan, Llangernyw, Llanfair T.H. and Llannefydd. Some walks include sections of the waymarked North Wales Pilgrim's Way from Holywell to Bardsey Island and the Clwydian Way. The routes, which range from a two-mile walk to an ancient hillfort to a 7 1/2-mile valley and upland walk, follow public rights of way and permissive paths or cross Open Access land. A key feature is that most individual routes, as well as containing shorter walk options, can easily be linked to provide longer and more challenging day walks, if required. Each walk has a detailed map and description which enables the route to be followed without difficulty. A superb 'undiscovered' area.